Like most kids, my children love s'mores. Since we live in the country, we have regular bonfires throughout the summer. And, at our house, a bonfire means s'mores. I had promised them I'd make brownies while they were at school recently. They were expecting a run-of-the-mill version, but I ended up surprising them with these over-the-top s'mores brownies. This is definitely a knife-and-fork treat. They are messy and gooey - following in true s'mores fashion. I took a shortcut and used two box brownie mixes, but you could easily make s'mores brownies following a from-scratch brownie recipe. The best part of this yummy dessert is the way the toppings get all toasty. 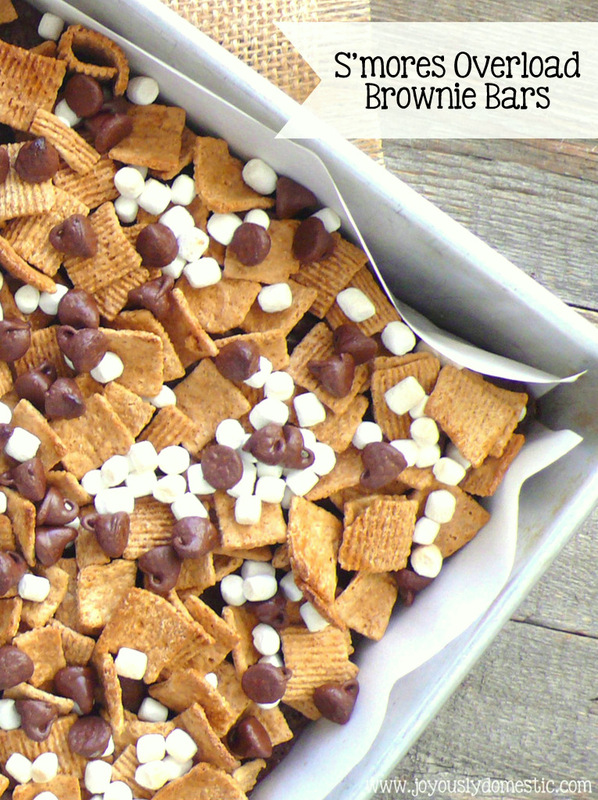 You really get the same sensation as eating an actual s'more, but with the added bonus of a brownie as the base! Line a 9 x 13 baking pan with parchment paper - including the sides. Lightly mist with non-stick spray. Prepare brownie mixes according the package directions. Pour into baking pan and bake at temperature called for on package directions, but remove from oven a few minutes shy of being done. Turn oven to broil. Slather on the frosting or Nutella - it will start to melt. That's what you want so that the toppings adhere. Top with the cereal, marshmallows and chocolate chips. Place under broiler for just a couple of minutes. Be sure to watch closely so things don't burn. Allow to cool. Lift brownie out of pan using the parchment paper. Cut and serve. NOTES: Regular mini marshmallows can be used if you can't find the Mallow Bits. Use a little less cereal if you want the toppings to adhere almost completely. Otherwise, some cereal will fall off when the brownies are cut. But, we love Golden Grahams and wanted a lot!